Sample some premium vino without splurging on a whole bottle. Ever wish you could try some of that expensive wine without buying the entire bottle? 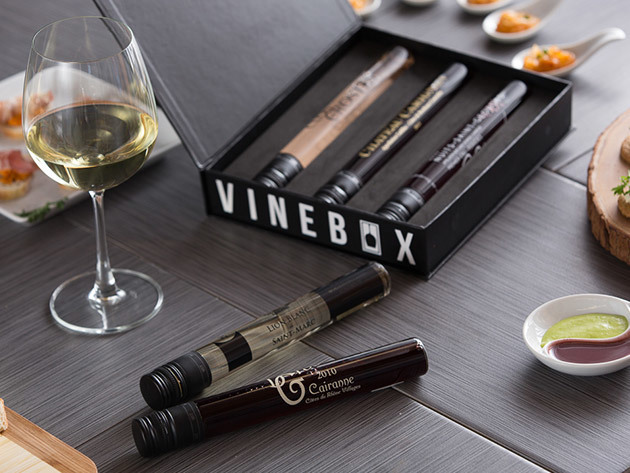 Check out VineBox premium wine club, a monthly subscription box of three top-quality wines delivered right to your door. Instead of paying for the full bottle, you receive three delicious, carefully selected wines by the glass. VineBox’s team hunts down the best wine in the world for selections that might not even be sold in the U.S. That means you get special access to an eclectic selection not available in your local market. These individual-sized glasses are packaged without exposing the wine, so you get to enjoy each sip as it’s meant to be enjoyed. You even receive tasting notes and recommended pairings, in case you want to turn the wine flight for one into a date for two. Go ahead and expand your palette with these premium glasses of vino from boutique wineries across Europe. You can now get your first month of VineBox for 40 percent off MSRP, or just $21 from the Daily Dot store. The price includes the cost of the first box, and you can cancel or skip a month at any time—although you might not want to. Want to save money this holiday season? Follow @DailyDotBazaar and find some sweet deals!